Home Crucible Is Last Hope The Best Sidearm For Destiny 2 PVP? 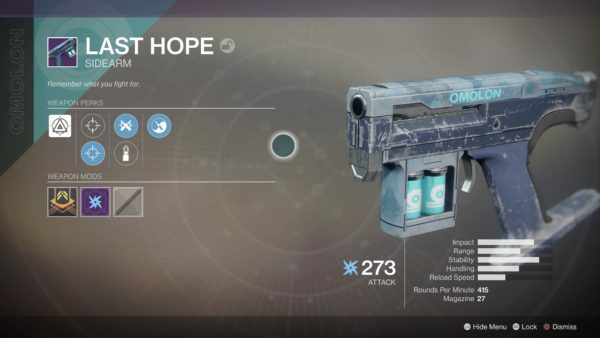 Last Hope is a Legendary Sidearm in Destiny 2. Not only this but it’s being hailed as one of the best weapons in Destiny 2 PVP, a tall order for a simple Sidearm. So what makes this little pocket pistol so dam special? Destiny DB rate Last Hope as the #33 PVP weapon, but some Guardians think it’s better than that, placing it in the top 7 weapons at least. The weapon’s Perks and stats put it in a decidedly average place, but average for Omolon is pretty damn good in general. The weapon fires 491 rounds per minute, has an Impact of 75, Range of 41, Stability of 82, Reload Speed of 37, and Handling of 55. The hidden stats are Zoom 12, Inventory Size of 47, Aim Assistance of 70, and Recoil Direction of 93. Like I said, these stats are fairly average but if you look at where the high points are, the Impact the Stability, and the Handling, these are all things that are important for making those concise shots in PVP. The Perks for this weapon begin with Omolon Adaptive Frame, which means this weapon fires a 3-round burst. Next up you can choose between Control SAS, which increases Handling Speed and Stability, or FarPoint SAS, which greatly increases Range, but decreases Stability and Handling Speed. Next up it’s between Ricochet Rounds, which increases Stability and Range, while also making rounds ricochet off of hard surfaces, or Steady Rounds, which greatly increases Stability but decreases Range while optimising recoil control. The final Perk is Zen Moment, which increases Stability while you’re causing damage with the weapon. The Perks here can be used to offset the poor Range and really ramp up that Stability, as well as the general Handling of the Sidearm. The thing is you don’t really need Range on a Sidearm, because it should be what you’re pulling out when your other weapon has run out of bullets in the magazine in a pinch. What a lot of this boils down to is what weapons suit your play style. If you’re a sniper then you generally won’t be close enough to anyone else to use a Sidearm, but if someone sneaks up on you then you’ll need it. The same goes for Scout and Pulse Rifles. Auto Rifles are a different story because you’re already in close quarters when your enemy is in front of you, and the same goes for Shotguns. The final verdict on this weapon, for now, has to be that it’s pretty damn good for PVP but it’s not the best weapon for it. If you’re going to go hunting for Guardians you want something with more accuracy and power, meaning anything but this. However, you do need something to protect you when the ammo runs dry, when you’re on a killstreak and you don’t have time to wait to reload or even aim. For those pant-wetting moments in PVP, Last Hope is you’re gun. Previous articleDestiny 2 – What Are Warminds?